⚓ T218349 Update translation for "mobile web edit" change tag to "mobile web action"
Update translation for "mobile web edit" change tag to "mobile web action"
Now that rEMFR86aa0dc4b84f: Allow all RecentChanges to be tagged with mobile tags has been merged (see T215477: Tag Thanks actions with AMC tag), the majority of actions, including account creations, are now tagged with the mobile web edit change tag ("tag"). 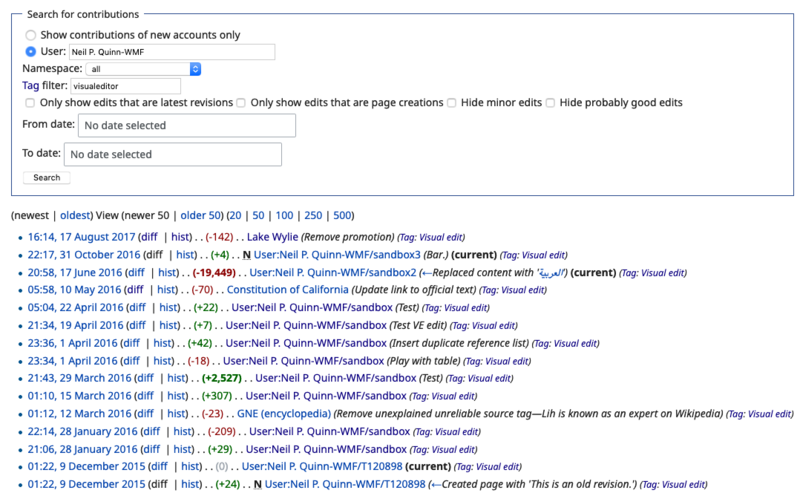 However, the edit part of that tag is only appropriate when the user is editing the wiki. Given the above and T218349#5026330, it makes sense to rename the tag rather than to deprecate the ...edit tag or to maintain both in perpetuity. 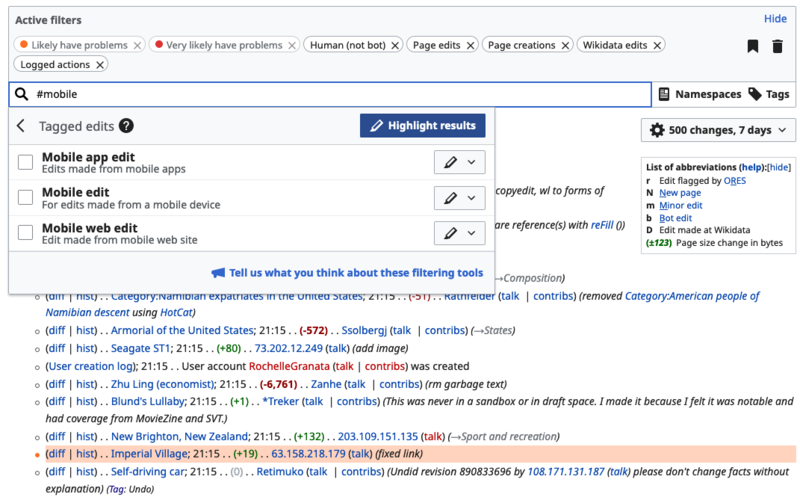 Yes, some of the analytics work is in the separate wikimedia-research repo (search) and thus not covered by the GitHub search in the task description. Just to clarify, it won't be a concern if your new tag covers everything currently tagged with mobile web edit (whether by backfilling the new tag or renaming the old tag). If instead you start setting a new tag and leave the old tag as is (which seems like it might be your plan), I would dislike that since all my analysis from now on will have to look for either tag instead of just one. And, since we're revisiting the name of this tag, maybe we should change it to MobileFrontend or MobileFrontend action? This is perhaps a bit more confusing, but more accurate since (as I understand it) anyone who uses MobileFrontend, no matter what their device is, will have this tag applied. Tags can be linked in the interface to an explanatory page, so that would help alleviate the confusion. After filtering out my own searches for the strings, web requests using with either mobile%20edit or mobile%20web%20edit are very rare . @Neil_P._Quinn_WMF - Previously only article edits/file uploads were tagged with mobile web edit, mobile edit tags. We removed the extra IF statement that was causing the system to skip tagging different actions. Now all actions will be tagged with mobile web edit or mobile edit, the only requirement is that user has to be on the mobile site (we don't check the action type before we tag the action). phuedx renamed this task from [WIP] Rename "mobile web edit" change tag to "mobile web action" to Rename "mobile web edit" change tag to "mobile web action". When I edit the message "tag-mobile_edit" i18n/en.json in MobileFrontend to say "Mobile web action" Special:RecentChanges updates to show the new label. Or maybe I'm misunderstanding the question - distinguishing old data from new data is trivial after all, considering that the only difference is that the new version of the tag will encompass non-edits too, as @pmiazga explained above (T218349#5026951). Perhaps you meant something else? What is the problem statement here? Distinguishing old data from new data or updating how it appears in the interface? (the latter is easy but the former is a big undertaking and I want to check it's worth all that effort - from what I remember when apps started using the tag, web didn't change their tag before for this reason). I think that the main problem is that this tag is already translated and if we update the English translation, we need to convince translators to change all translations. Maybe we can remove all translations for tag-mobile_edit? I'm not sure I understand this. We can change en.json easily by a change to en.json in the repo. This will be syndicated to translators with the recommendation that this applies to things other than edits. Why is it a problem that tags are already translated? From what I'm reading this is a trivial change (XS size, 0.5) which just needs a little communication. Am I missing something? Do you think this should be a separate task? That might improve coordination with code changes. Is this something Readers Web should expect to build and execute or should the database team be involved? but then it has to be done during deployment window so code immediately starts using a new tag. With that there will be no need to update all rows in change_tag table. In case it wasn't clear I strongly recommend against rewriting this in the database - it's not worth the effort and potential loss of date. I think we should just update the translation. On the other hand, I still think that this tag should be renamed to "MobileFrontend" so it's more clear what this tag actually means and so that we have space to introduce a tag actually tied to device details if we want (translation might be a challenge, although we might be able to address that with the display name). In that case, I think it would be worth rewriting the database because having a tag whose meaning and display differed so much from its database name would be significant analytics debt. • Jdlrobson renamed this task from Rename "mobile web edit" change tag to "mobile web action" to Update translation for "mobile web edit" change tag to "mobile web action". My understanding is that tags can't be looked up by their translated name so existing references to "mobile web edit" would have to stay. Is that correct? Hmm, thanks for pointing this out. It looks like I'm actually wrong. If I understand correctly, you're talking about a user filtering a list of revisions using a tag. The "new filters" used in the recent changes list and the watchlist allow you to browse and search a list of tags using the display names, so there, it's not an issue to have a difference between the display name and the database name. However, in the old style changes list (used on Special:Contributions and by people who have opted out of the new filters), you have to type in the tag name used in the database, and there's not even a dropdown list to help you understand that. So if we just changed the tag's display name, users would have to know that, if you want to get a list of the edits with the tag "Mobile web action", you'd have to type in "mobile web edit". In many ways, this is already an issue: to get edits tagged "Mobile web action", you have to type "mobile web action", case sensitive. Even worse, to get edits tagged "Visual edit", you have to type "visualeditor". Even worse than that is that situation on non-English wikis. For example, on the Arabic Wikipedia, to get edits tagged " تحرير مرئي", you have to type "visualeditor". You can see the mapping if you go to Special:Tags but it's still an awful user experience. So we wouldn't be making the situation that much worse. But still, let's not do it. Leave the tag as is. "Mobile web edit" is not very wrong, applied to a log entry. I doubt many users would be (newly) confused. Change the tag name in the database. Users would still have to relearn the secret tag incantation, but at least the secret incantation for "Mobile web action" would be "mobile web action", which is kind of easy to remember. Fix the problem for good and let users search for tags by display names. Likely to be a significant amount of work and a distraction from your goals, although of course someone has to do it eventually.